Named after the Westminster Larger Catechism, which expands on the Westminster Shorter Catechism, this collection is ideal for those who want to dive deep into the teachings of the Reformed tradition. Many of these resources come straight from the Reformers and Puritans themselves, or are written by modern scholars within the tradition. A study Bible is a solid resource with which to begin understanding Scripture. The 1599 Geneva Bible notes were written by English Reformers who had come to Geneva to learn from John Calvin; the result is a study Bible influenced heavily by Calvin and written, translated, and edited by other Reformers. The Reformation Heritage KJV Study Bible, edited by noted Puritan scholar Dr. Joel Beeke, is also included. It contains notes that explain Scripture and makes the KJV much easier to read with explanations of some of the more archaic words or phrases. Last, but certainly not least, this study Bible includes the Apostolic, Nicene, and Athanasian creeds, as well as the Westminster Standards and the Three Forms of Unity. Sometimes you need more than study notes, so we've also included the commentaries of John Calvin and Matthew Henry. These are well known and important works for understanding Reformed teaching on Scripture. Additionally, the Works of William Perkins two-volume set contains commentary from William Perkins and Ralph Cudworth on Galatians and Perkins’ commentary on the Sermon on the Mount. This set also includes a few other works by Perkins, who is often referred to as the father of Puritanism and whose teachings were very influential in the formation of the Westminster Standards. In the field of theology, we've bundled together some of the most treasured works in the Reformed tradition, including Augustine's Confessions, Calvin’s Institutes, Wilhelmus à Brakel's 4-volume Christian’s Reasonable Service, Charles Hodge's Systematic Theology, and Puritan Theology: A Doctrine for Life. Through these resources you can obtain a thorough, in-depth understanding of virtually any Reformed doctrine—as well as discover practical applications for life and worship. If you want to dive deep into reformed theology, piety, and practice, this set is for you. 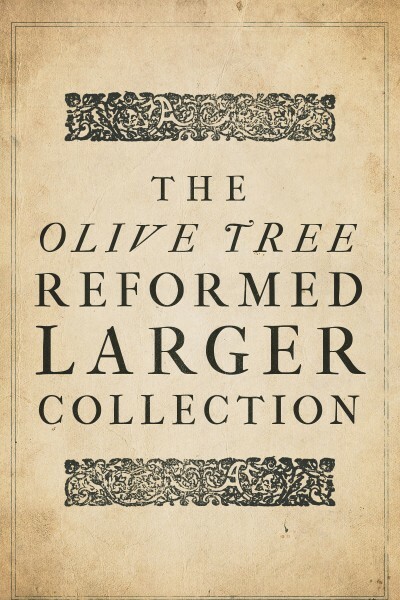 If you are interested in a less expansive set, be sure to look into the Reformed Shorter Collection also offered by Olive Tree.